Would you like to join the Friends of Dunstable Cemetery as a volunteer? Dunstable Cemetery is a Green Flag Award Winning Cemetery which was first open to public burials in 1861. The Cemetery has grown over the years and has a rich history. The older part of the cemetery is the last resting place of some notable local people along with some beautiful old memorial stones as well as a wide variety of wildlife including over 25 species of birds. 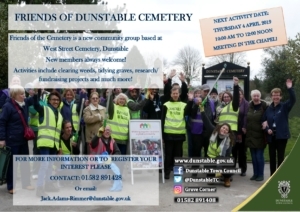 A new friends group for Dunstable Cemetery has recently been established and membership is now beginning to grow. The friends are a small but friendly group of people who enjoy coming together for volunteer work days. In future the group would like to fundraise to repair some of the older memorials and research and share some of the life and family stories of those buried in the cemetery. Please keep an eye out for any activity days below!